This time through though I noticed something that I had never noticed before. You know how people complain about how Anne is too romantic? (I'm not those people, by the way.) They say she's not real. Everything is too nice and rosey, neatly wrapped up in a beautiful package. I don't care for these criticisms of my beloved Anne but this time around I did notice that Anne is remarkably light and peppy compared to some of Montgomery's other works. After having read Montgomery's journals I think it is interesting to note that she created and wrote Anne before she was married. These Anne-nay sayers tend to prefer Emily of New Moon, who they say is more "real", having experienced more sorrows. Well, Emily was written after Montgomery was married. I think it's important to note that a chief difference between Anne and Emily is "simply" Montgomery's life experience. I think this goes to show how important it is to have a varied amount of experiences before one picks up the pen. Am I saying that Anne ought not to have been written? Oh no! I would never say that because I could never believe it. I love Anne just exactly as she is. But I did notice a, I guess you'd say, lack of maturity on the part of Montgomery in this particular book. It is not remarkable to me that Anne was instantly loved and was the catalyst which propelled Montgomery into the limelight, but it is fairly clear that she was something of an underdeveloped writer at the time. There is no way she could have penned Emily or The Blue Castle during this time period of her life. But depth of despair, love, moving away from home, and seeing a little more of the world certainly improved her ability to create stories which people could more readily identify with. Anne is a dear and I love her to pieces (and always will) but she's a first launch and that's more clear to me in this reading. 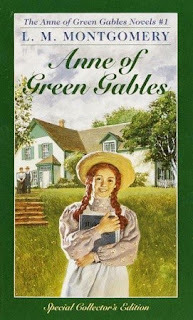 In no way do I mean to make this reading of Anne of Green Gables sound like a negative experience because it simply wasn't. I enjoyed every minute. I laughed in all of the right places and cried in the right spots too. I thought more about the plight of orphans around the globe and how we do such a better job caring for them that we did even 100 years ago. This is a result of education, and understanding that all humans crave love and need nourishment and consistent care. It is a Christian understanding that we are to reach out and share love with others that has brought about such change. This being said, we have ever so much further to go in educating people as to what an orphan is most in need of but if you glance back just 100 years you'll see massive progress and that's something to be happy about. Also while reading the story to myself, I invited my kids to watch THE movie with me. I knew it would be fun to introduce them to Anne but I underestimated exactly how much fun it would be! Bookworm1 (age 8) also leaned over in laughter at all of the right places. "Would you please call me Cordelia?" set him off in a fit of giggles. Listening to him laugh reminded me of watching it with my (now deceased) dad who also got such a chuckle out of the Anne-girl. Anne, for me, is not just a character I love but one that has permeated all aspects of life. I've shared her with so many people that I love and when you share something that you appreciate with others it only serves to make you love it more. Perhaps it is our love for Anne which provides the depth of character in her that so many claim is missing. Anne might not be the deepest character in literary history. She might be fanciful and flighty. You might have a hard time appreciating her life at Green Gables. But it cannot be denied that she has captured the imagination of the world with her own. Each time she makes a person laugh, smile or even cry makes her a more developed character because she becomes a part of who we are. She is definitely a part of who I am. I enjoying visiting with her again and will look forward to many more visits in the future. There is a certain optimistic innocence to Anne . . . is it really reasonable that a child who had been orphaned in infancy and shuttled from orphanage to uncaring foster home and back for 11 years could be so ready to bond, so eager to please, and so lacking in any developed issues like lying or theft? But we will always love Anne best anyway. It's the hope that the good will come out uppermost regardless. That would totally make sense regarding Anne's positivity and Emily's realism and when she wrote it. How very interesting! It's been a while since I've actually reread Anne - I think I need to make time for it this year! I never thought of Anne as rosy or romantic - I thought she had plenty of hardships - but she seems to have handled them better that Emily. Interesting to think about the difference in perspectives between the writing of the two. I've heard that Emily is closer to LMM's actual life, and it's interesting that came out in her writing after her marriage. It's been so long since I've read the Anne stories, that I need to add them to my "to read" list this year. I need to re-read Anne as well, but I love the background info about when Anne and Emily were written and why they are different. So intriguing! Interesting thoughts on Anne. And always delighted to read them! This is really interesting! I haven't really paid attention to when LMM wrote each book, in comparison to her married life. I'm going to keep that in mind as I read now, though. I DO like Gilbert so far, but some of the men she writes are probably truer to real life than I want to read about in "romantic" fiction, so I'm not that fond of them. I'm curious at what point she was in her life when she wrote them now.